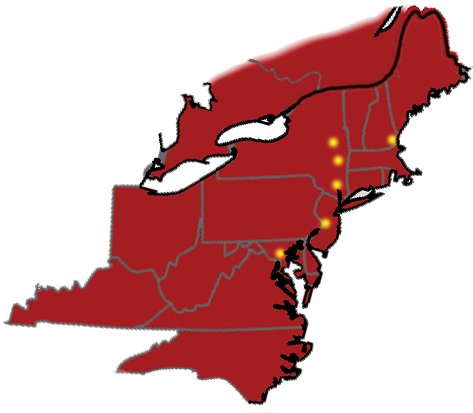 Through our five Terminal Network, we have the ability to service your customer’s delivery needs in the Mid-Atlantic and New England areas. We do this safely, through an operations team with over 300 years of combined experience. No job is too big or too small. We can handle irregular routes, dedicated carriage and jobsite deliveries. Need Tarping services, we can do that also through our company Hudson Loading Services. For lanes outside of our network we can arrange transportation through Hudson Logistics Services. We are results oriented and our transportation portfolio is here to make your life smoother! Our service coverage includes all of New England, the Middle Atlantic states, and the Midwestern states of Ohio, Indiana, and Illinois. We excel at servicing the metro New York/New Jersey markets. Service to all other states in the lower 48 is available as well. We also handle cross-border shipments to and from Ontario and Quebec, Canada. Shipments are expedited because our drivers are certified for FAST, and we participate in the ACE electronic document submission program. George Hildebrandt Inc. maintains terminals in Hudson, NY; Rensselaer, NY; Buchanan, NY; Burlington, NJ; Portsmouth, NH; Bristol, CT; Baltimore, MD; and Aberdeen, MD. These strategically located facilities allow maximum flexibility in servicing your needs. We utilize the latest information and communication technologies to offer greater operating efficiencies and to provide you with the highest level of support. Serving New England via our facility in Portsmouth, NH. Our Baltimore facility gives us a reach down south. Our centralized NJ facility gives us delivery capabilites from Ontario and Quebec, to the southern states and beyond.